Kryamla's Armor - Now with Upgrades! 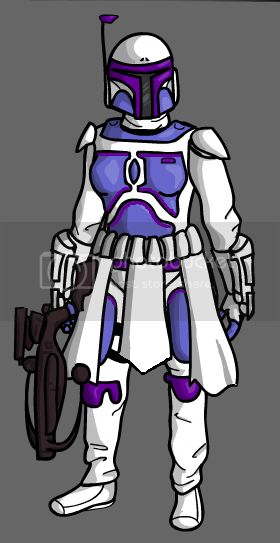 Mandalorian Mercs Costume Club > Mandalorian Armor > Female Armor (Moderators: osukaru, Hik'aari) > Kryamla's Armor - Now with Upgrades! Hello fellow femmandos! 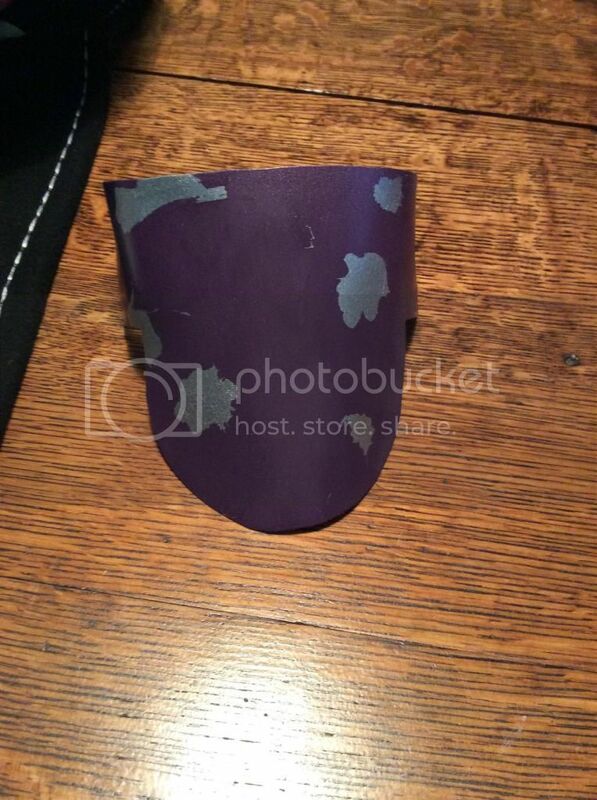 I already have my soft parts started and almost completed so I figured it's about time that I start my armor thread. (see signature for the soft parts thread link) I currently do not have lots done and it probably going to be a long process since I'm in my final semester of college. Here is the overall goal/look for my armor. Here is a picture of my right knee and both shoulder armor parts. I only have the right knee because I accidentally cut through the left and have yet to make a new one. This is the first coat of silver for the base. So I need to black wash still amongst other thing that still needs to be done. But any thoughts or comments thus far? What is your armor made from? It looks pretty thin, which has lead to warping during the shaping process. It's kydex. And yes I agree. When I ordered it, I didn't realize that it was going to be that thin. Any suggestions to fix it? Is Kydex similar to Worbla? Do you have enough to dual layer it? You could also form it on a buck, which is basically just anything solid that you can press the material onto and form the shape around instead of doing it by hand. It's a plastic type material. I'm not sure what worbla is like so I'm honestly not sure about that. I can try reshaping it using the buck method! If not, I'll go with another method. Are you talking about on the shoulder thingys? Yes, particularly on the forward edge. Gotcha! Thank you! I shall do that! I'm not crazy, I just find sanity boring. yeah the form on them could use a little tweaking... I'm not as much of a fan as thinner plastics, as they tend to do funky things when they get hot.. a trick to eliminate that is dont get them quite so hot next time, sometimes you can heat them enough, and bend them to the shape you need. You could also try to find some cans or jars or something hard and sturdy to bend the plates on to give them a more uniform bend. "I only take 2 things seriously: the lives of my vode, and the deaths of my enemies"
Ni redalu o'r vhetin be'kyram. "I dance in death's valley"
"we're not mercenary's, more like adventure capitalists"
Kydex is the material that fitted gun holsters are made from. Most are either wet-formed leather or Kydex. Even though it's thin, it should be pretty durable. I haven't quite decided in what direction, everyone has given good advice so now it's just sorting through it all. I'm at the point where I'm considering buying the armor and painting it. Lots to think about! But thank you! 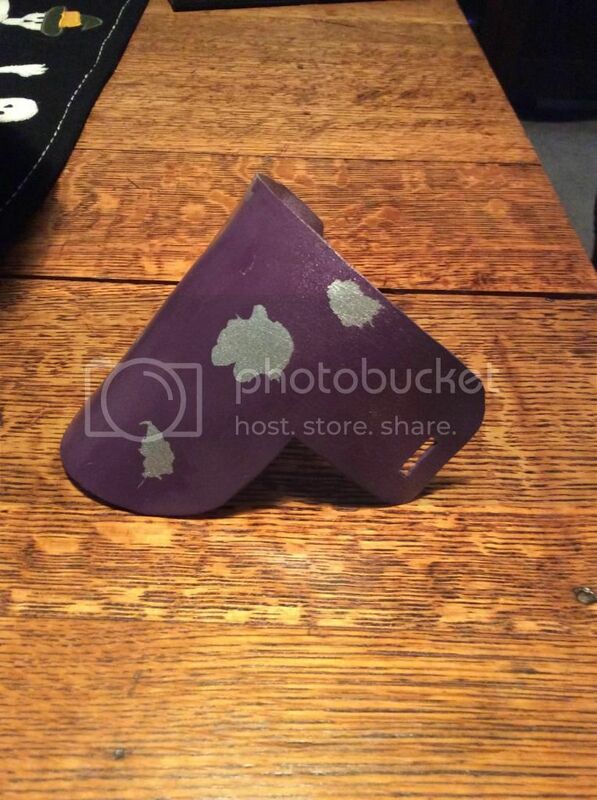 That's how I got the idea to use kydex for the armor, my boyfriend has made some holsters out of it and it seemed relatively easy to work with lol. But time will tell if I decide to further the use of it or not. You can go in either direction with the armor, there are some great armor makers here on the boards and you can get a set at a really reasonable price. If you want to do the home made, as others have pointed out, heat it up until it just starts to bend and then form it. Shoulders don't need much of a bend, so just making them even is a good thing to shoot for. Knees are pretty similar in that the forming is more of a "u" shape when you look at them from the top down as it would fit on your knees. 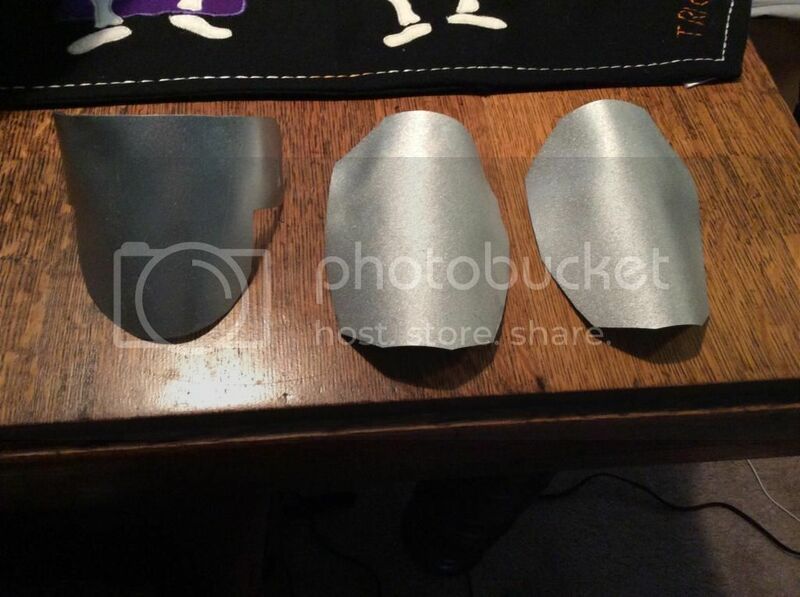 My chest plates, I literally heated one side at a time and using heat resistant gloves so I didn't burn my hands, pushed the plates to my chest to help get the shape and the bends in the right places. Highly suggest putting on your vest first as using that as a layer of protection from the hot plastic. If you are going to do the formed breast plates, you'll have to watch the forming over complex curves as the plastic can form folds, and if you get the pieces too hot, they will warp and create sharp bends/divots that you have to reheat and gently coax back into shape. Another way is to use a bowl with a rounded bottom on the inside and get the plastic heated up and then push it gently down into the bowl, usually using something round to push the plastic with, to form your cups, remembering to leave enough material for the bottom corners of your plates and when you are forming plastic into cups you have to remember that the flat shape will be bigger than you think. 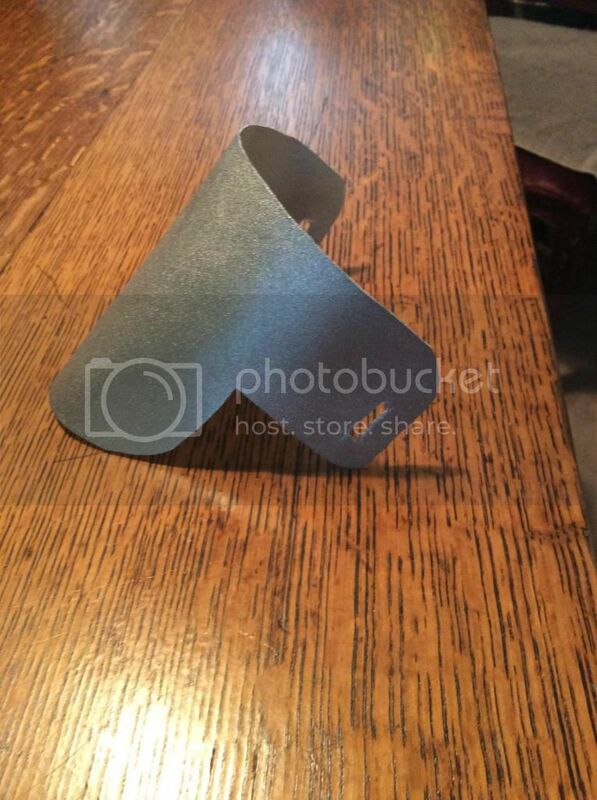 A tool that a lot of costumers use is to make a duct tape dummy of themselves so that they can form the armor to their body shape and is usually a lot easier than trying to push the items onto yourself. Anyway, looking forward to seeing your armor progress. I'm thinking at this point in time, I'm planning on buying armor from the mandalorian arsenal. I've seen a lot of people use their armor and they have pretty reasonable prices. As for a helmet, Im hoping to buy a helmet from saz. I just have to save a little bit more for everything and hopefully I'll get that going soon! I got all my armor, save for my shins and gauntlets, from Mandalorian Arsenal. Great products, definitely recommend!